Countless stories have been written about the world’s most widely consumed alcoholic beverage: BEER! Well, here’s another yarn — with an entirely different twist. The true story — which would bring smiles to millions around the world — began more than a decade ago on a hot, sunny day in South Australia. At around two in the afternoon on 15 November 2000, three young men made their way to the historical Austral Hotel, a popular pub on Rundle Street in downtown Adelaide. In no time at all, the blokes were sipping cold Coopers Pale Ale in the shade of a large umbrella at an outdoor table sandwiched between the 120-year-old pub and busy Rundle Street. The Austral Hotel – 205 Rundle Street, Adelaide, South Australia. I did not know the guys. Sorry, blokes. But I kept a close eye on them. I was not sitting at another table, however, nor was I inside the air-conditioned pub. And I wasn’t in one of the shops across the street. So where was I??? 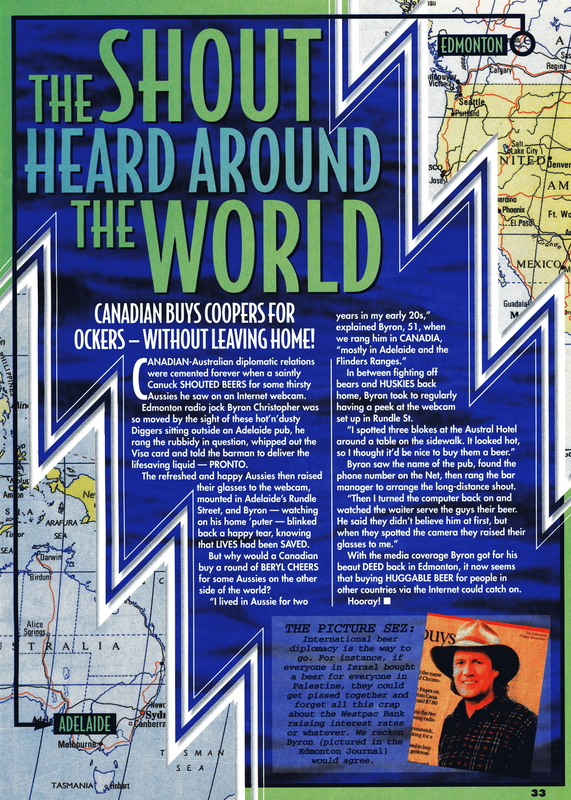 I was halfway across the globe — more than 14,000 kilometres distant — in my home in Edmonton, Alberta, Canada. And I was watching everything unfold on my old Mac computer. In Adelaide, it was a bright sunny Wednesday and a balmy 30 degrees. In Edmonton, it was late fall, night time and minus 7. It was also the previous day, Tuesday. In 2000, the Internet was still a relatively new phenomenon, at least for me. I was so naive about computers that I was blown away somebody could log onto a website on the other side of the world. The website of the Ngapartji Multimedia Centre in Adelaide featured a live robotic camera which viewers could operate from their own computers. The $10,000 camcorder was mounted outside a 3 story building, and shielded from the elements. By clicking on the tiny arrows on the screen, the camera could be moved up and down and from side to side. The camera also had a zoom lens … a lens so powerful that one could read newspaper headlines in a shop window across the street. The bill came to $7.80. I gave McDowell my VISA number and added a tip. The ‘shout’ [as its known in Australia] came to 10 dollars even. If I was in Canada, McDowell pointed out, how could I see his patrons? And so I told him about the video camera. Within seconds, a man appeared on my screen … holding a tray and three tall glasses of beer. After he broke the news to his puzzled patrons that someone in Canada just bought them a round, he revealed they were being snooped on by a surveillance camera down the street. The men began looking around for it. The server then pointed towards a camcorder mounted on the 2nd floor of a building. The men looked up at the camera and raised their glasses. When I saw that, I immediately broke into a big smile. The idea of buying beer for strangers over the Internet was spontaneous, of course, and a bit of a lark as well. Fine. But it was much more than that … it was a random act of kindness, a gesture that would bring smiles to millions who found out about it through the media. 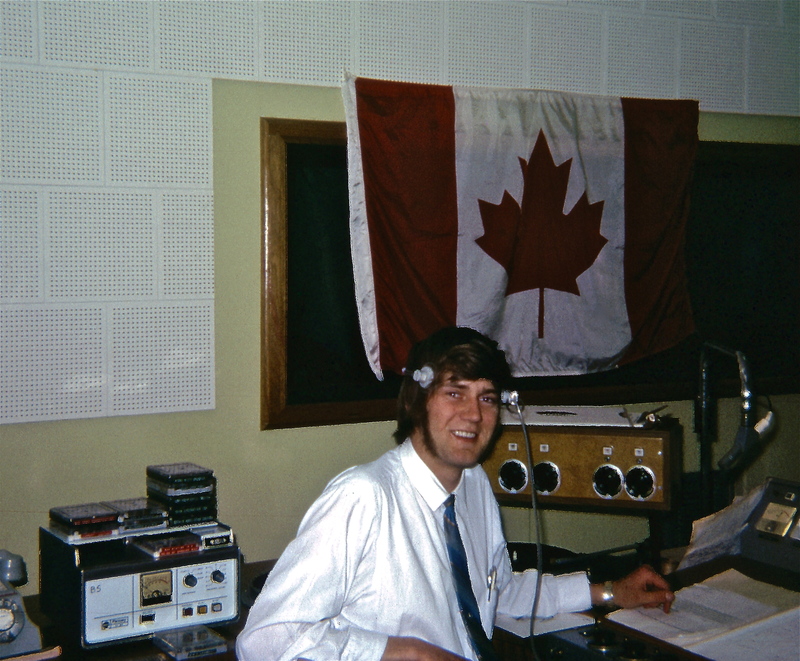 I worked in radio and television in Australia from 1970 to 1972. When I landed in Sydney in April 1970, I was 20. I have many fond memories from my time Down Under. I especially recall the kindness of people I knew through work and on a personal level. As an ad salesman for Radio 5AU in Port Augusta and GTS Television in Port Pirie, I traveled in my small white Datsun 1200 throughout the Spencer Gulf region, including the Flinders Ranges. I was about 3 hours’ drive north of Adelaide. I often had lunches and ‘teas’ [dinner] at pubs in the small towns. Some of the pubs were as old as the Austral in Adelaide. One, in Port Augusta, had the same name. The neat thing about spending time in Australian country pubs was that people would sometimes buy complete strangers a beer. Or, if they were eating alone, invite them to their table. That happened to me a few times. Thinking about that now makes me smile. The Australians were a friendly, down-to-earth, caring lot. I must say that I was treated very well during my two-year stint Down Under. I was a young man and the kindness of the Australians made quite an impression on me, one that remains to this day. Friend and announcer Fred Wheeler, his wife Judy and their young family at Radio 5AU in Port Augusta . I enjoyed my time at AU. 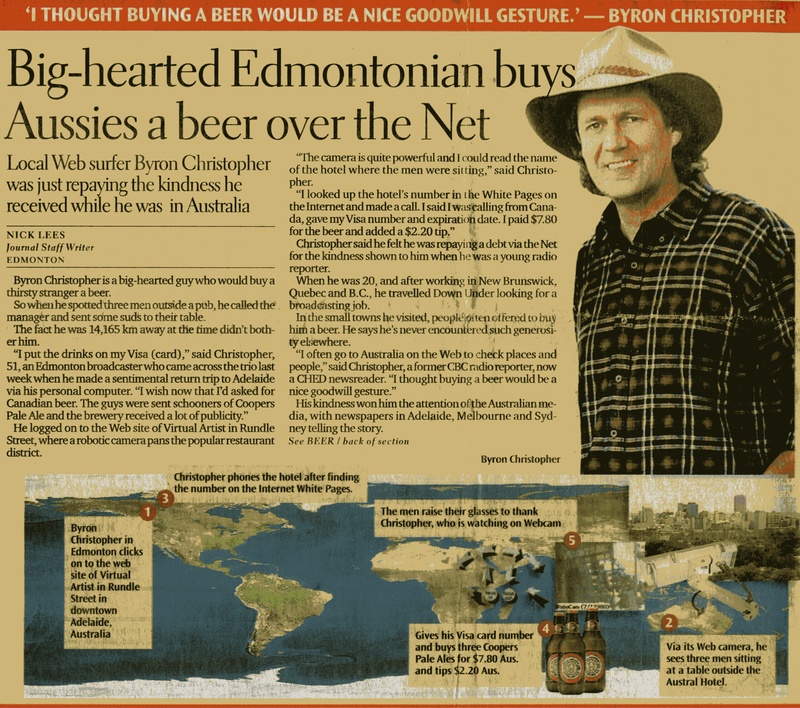 Within days, The Advertiser, the largest-circulation newspaper in South Australia, ran an exclusive story about a man in Canada who bought beer over the Internet for some blokes sitting outside a pub in Adelaide. Reporter Mark Steene’s questions were technical: how did the camera work? … where was it located, stuff like that. He also asked if I knew the men, and why I did it. I said I didn’t know them … but I sure knew the Australian character because decades earlier I’d worked and lived in his country. After the story broke, the robotic camera got a good workout … and a certain pub on Rundle Street was packed. Television news crews showed up as well. Reporters tried to find the three blokes who were central to the story but according to reporter Steene, they chose not to come forward. It was his understanding that when the boys were drinking, they should have been at work! Perhaps that explained why the guy wearing the baseball cap was antsy. He either wanted to take a leak or take off. The Advertiser illustration showing how the eBeer purchase came about [click to enlarge]. The eBeer story also flashed across Australia on news wires, where it was picked up by other media. It wasn’t long before both Australians and Canadians were talking about the unusual beer purchase. According to a reporter in Sydney, Canadian tourists Down Under started getting free drinks after the story broke. What began as a lark had turned into a feel-good kind of story. I was touched by the kindness of the Australians and, turns out, so were they. Back in Alberta, reporter Scott Pattison of the Edmonton Sun did a half-page story on what had gone down at the pub in Adelaide. 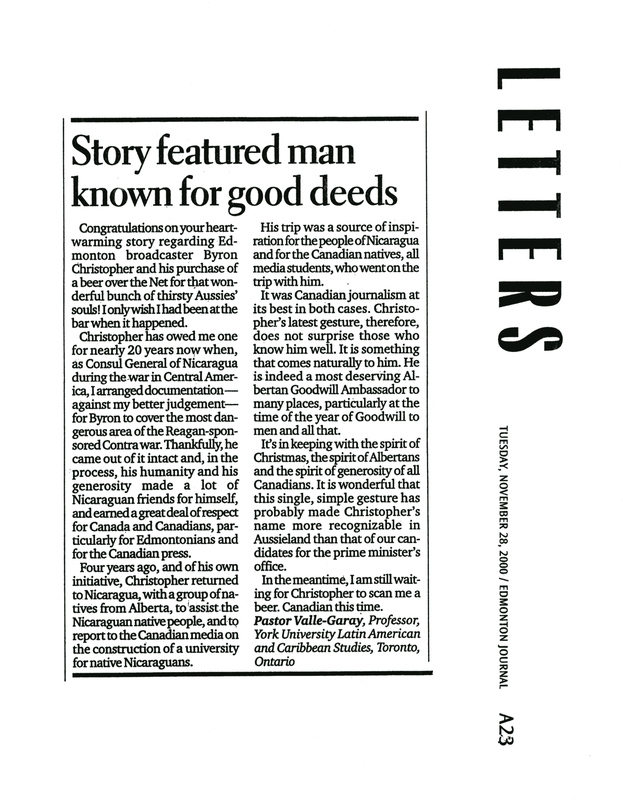 Reporter Nick Lees of the Edmonton Journal then did the same; his story also appeared in the Calgary Herald. From the front page of the Edmonton Journal : Friday, 24 November 2000. A ‘Letter to the Editor’ of The Edmonton Journal from a reader in Ontario [click to enlarge]. The story also appeared in The Tribune in my hometown of Campbellton, New Brunswick. Coverage by Edmonton’s two major newspapers prompted the city’s Mayor, Bill Smith, to fire off a thank-you letter. Ditto with Economic Development Edmonton. EDE’s president — former radio broadcaster, co-worker and Member of Parliament Jim Edwards — sent a cheque for $10 to cover the cost of the beer. 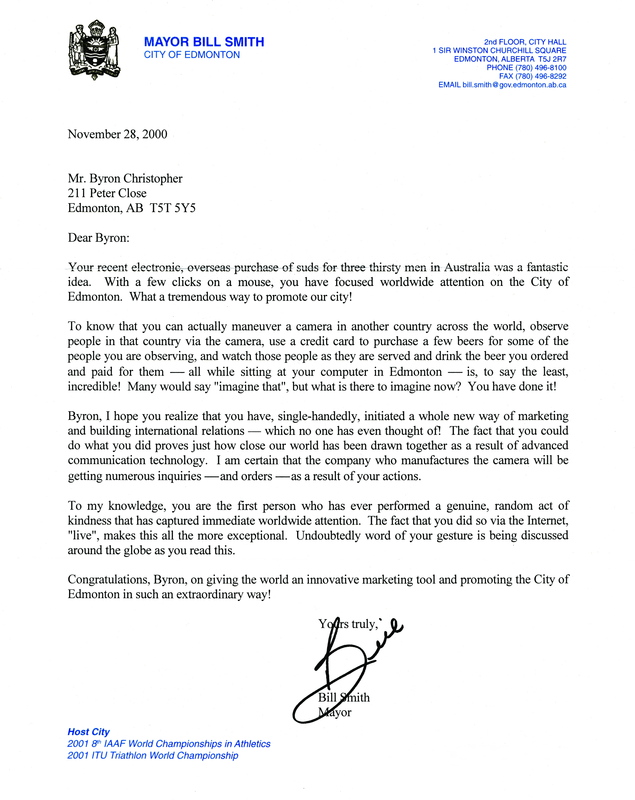 Letter from Edmonton Mayor Bill Smith [click to enlarge]. Then the strangest thing happened. The Picture, a best-selling men’s magazine sold in Australia and New Zealand, did a full-page story on “eBeer” because — as its reporter explained — a lot of people were talking about it. I’ve long forgotten the name of the reporter, but the man asked some insightful questions. We talked for about an hour. When he called I was cradling a cordless phone and plowing snow off my driveway. One fond recollection I had of my time in Australia was that I could leave the keys in my car — in fact, leave the car running — and not worry that some bozo would drive off with it. “Don’t try doing that today,” warned The Picture reporter. Because of eBeer, I was able to connect with an old friend from my days at GTS Television in Port Pirie. Ross Challenger, now living in Port Lincoln, South Australia, saw The Advertiser story and set off to track me down. He fired off emails to a number of radio stations in Edmonton. One of his queries ended up at the station where I read news. 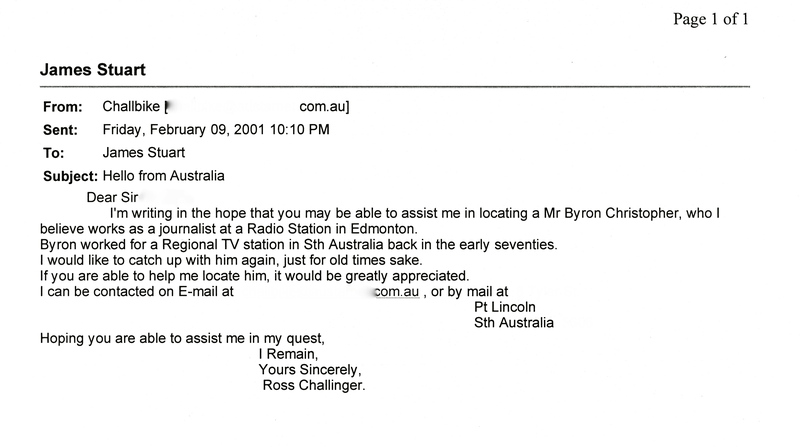 Email from Ross Challenger to CKNG-FM Radio in Edmonton. In 2010 I returned to Australia for a friend’s 60th birthday and for another’s wedding; both events in Adelaide, as it turned out. 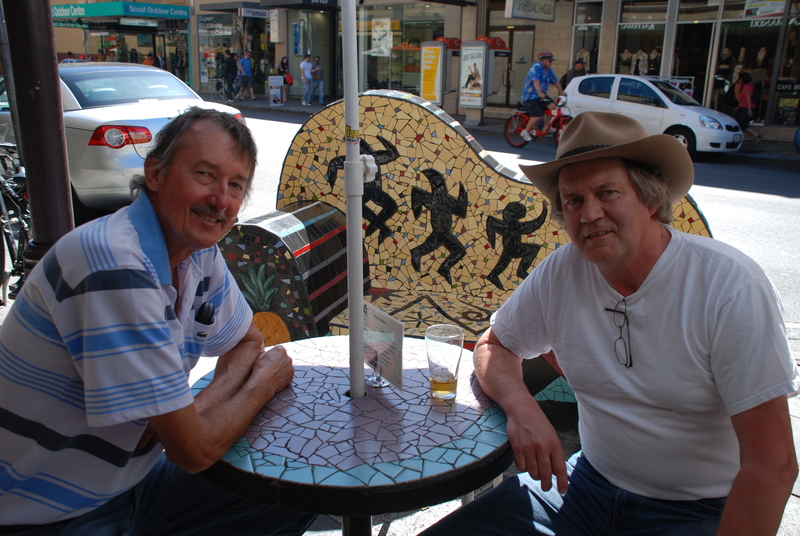 Another old friend, Lester Williams, and I got around to the Austral where we too sipped on some cold Coopers pale ale. Lester and Byron [‘Chris’ to Lester and my Aussie friends] outside the Austral. I’m wearing … what else? … a fine Aussie Akubra hat. Lester is one solid guy. I dated his sister, June, when I lived in Port Augusta. It had been nearly 10 years since I bought the three strangers a beer. Austral Manager Andrew McDowell was gone. When I mentioned to a waitress at the Austral the story of three patrons being treated to free beers over the Internet, she turned and said, “really?” A popular news story a decade earlier was now largely forgotten in the mists of time. I wanted to meet the fine folks at the Ngapartji Multimedia Centre, but unfortunately I was too late. The Centre closed its doors in 2003. I returned to the pub — alone this time — and sat at the very same table where the three men drank beer and solved problems of the world [and skipped work] on a hot afternoon on 15 November 2000. Thanks in large part to one cool draft beer, okay, several then, I reflected on what went down a decade ago. What became of those guys? Did they still live in Adelaide? What was going through their heads when the server marched out with the free suds? Were they in fact AWOL? And did they get in trouble when they got back to work? I mean, how do you explain you’re late because someone on the other side of the planet … poking around on their computer … bought you a beer? Unlike the cool suds, that’s hard to swallow. If you’re one of the blokes — or if you know who they are — please drop me a line. I’ll make arrangements — over the Internet of course — to get you some cold beer. BY THE WAY … if you would like to buy a thirsty patron at the Austral Hotel a beer, here’s the number to call … [from North America the code is:] 011-61-8-8223-4660. PS: I asked June Williams, my old girl-friend, if she’d drop around to a shop in Port Augusta and pick up a copy of The Picture. “What?” she said, “do you think I’m crazy? …” She never did. June Williams of Port Augusta beside my wheels, a 1970 Datsun 1200. Photo taken north of Adelaide in 1971. I just had a second look at The Picture magazine. Ooops. Sorry, June, I now see what you meant … guess I owe you a beer too! Great story Byron, your generosity continued; the Tommy’s coffee mugs still get ample use daily. Pretty cool, Byron … maybe you should be writing an autobiography … you seem to have led an eventful life … one worth remembering. Ciao. Love the new ‘head’ you’ve put on this 13-year-old pint. You’ve given this story lots of mileage with its new legs, even after three Cooper pints. Still waiting for our rounds at the ‘Strat’! Thanks for sharing the story, excellent as usual. Knew about this story before, but the way you resurrected it made my day. Thanks for sharing, I am going to repost it on my Facebook for others to enjoy! Fred Wheeler is my brother and lives in Nuriootpa, South Australia. Fantastic! Fred is my brother also. My wife, Jane & I will be in Canada for August and September. Perhaps we can buy you a beer when we are in Edmonton. Cheers! I am the person who was married to Mr Fred Wheeler in the photo with my children. Those were the days, doing all the washing by hand and vacuum cleaning with a dustpan and brush … what hard, trying days they were. I now live on a houseboat, am single and would not change it for a million dollars. I work with people with disabilities. Thanks Byron for the read. Cheers.